I saw an interesting post on another blog called, “Leash Your Fitness“. 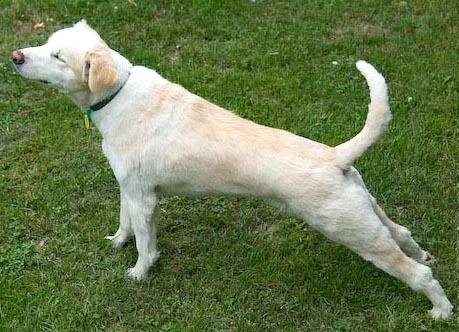 A young girl scout, Juliana Tom, has written a brochure about doing stretches with your dog. Just like humans it’s important for us to “warm up” before we get physical be it running or play time. The importance of cooling down & stretching after a work out. There is a well researched section on Cranial Cruciate ligament tears (the most common injury in dogs). It explains what it is, how it often occurs & most importantly a four month post surgery, rehabilitation regimen. I think it’s wooftastic that Juliana has done this. I bet she grows up to be someone who works with dogs. Maybe a vet. You can have a look or download her, “Happy trails for Dogs“, brochure & perhaps give your good dog a pleasing stretch.